Mr. Wesley J. Stuchlak, 64, died on March 6, 2018, at the Penn Hospice Rittenhouse in Philadelphia, PA.
Born in Bridgeport, CT, Mr. Stuchlak was a graduate of Bucknell University in 1975. He later received his Masters Degree from Drexel University. He was a project manager for IQVIA (formerly IMS) for over 20 years. He was a resident of Springfield for the last 24 years. 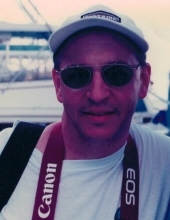 Mr. Stuchlak enjoyed photography, bird watching, traveling, archeology, wildlife, and history. He is survived by his wife of 23 years, Karan (nee Hannigan) Stuchlak and one son, Matthew Stuchlak. Friends are invited to his Celebration of Life at the Springfield Country Club on Saturday, March 17, 2018, from 1:00 to 3:00 PM. His family requests that memorial gifts be designated for Brain Tumor Research by David Andrews at Jefferson and may be made online or mailed to: Office of Institutional Advancement, 125 S. 9th St., Suite 600, Philadelphia, PA 19107. To send flowers or a remembrance gift to the family of Wesley J. Stuchlak, please visit our Tribute Store. "Email Address" would like to share the life celebration of Wesley J. Stuchlak. Click on the "link" to go to share a favorite memory or leave a condolence message for the family.